Enforcement of VAT requires accurate records of firm transactions that can be traced to both parties. This column describes how the Chinese government’s digitisation of the country’s VAT process increased enforcement, which in turn increased overall tax revenues in the short run. However, the increased enforcement caused firms to contract in the medium run, reducing the long-run gains in tax revenues. Value-added tax (VAT) accounts for approximately one-fifth of global tax revenues and is used by over 160 different countries (Keen and Lockwood 2010). VAT is generally levied on the difference between a firm’s sales and inputs, a setup that generates incentives to understate sales and overstate inputs. Therefore, in firm-to-firm transactions, the two parties face opposing incentives to distort the transaction value. This phenomenon represents an advantageous self-enforcing property of VAT and may be particularly critical in contexts with lower bureaucratic capacity or higher levels of corruption (Gordon and Li 2009, Kleven et al. 2016). However, credible enforcement is a necessary pre-condition for these properties, and enforcement of VAT requires accurate records of firm transactions that can be traced to both parties (Pomeranz 2015). Given the massive volume of economic activity in a country, this requirement poses a significant bureaucratic challenge. In this column, we explore whether information technology can improve VAT enforcement. We also analyse how increased enforcement alters firm behaviour, in both the short and medium run. This question has both economic and policy implications: whether increased enforcement results in higher or lower tax revenues depends critically upon firm responses. In this column, we will focus on the context of China, where a natural experiment in 2001 enables us to isolate the causal effect of enforcement. When VAT was first introduced nationwide in China in 1994, all invoices for sales and input purchases were hand-written and all cross-checking was performed manually. As a result, detection of fake input deductions and omitted sales receipts were exceptionally difficult; forged input invoices and under-reporting of sales were widespread. The government was aware of these shortcomings and made efforts to improve enforcement capacity. One such push took place in 2001 and was dubbed the Golden Tax Project (which shares its name with a terminated policy from 1996.) With this reform, the Chinese government digitised the entire VAT process – the generation of invoices, the reporting of firm transactions to the tax offices, and the detection of evasion would now take place digitally. The new, computer-based system assigned a unique, encrypted 84-digit code to every transaction, which would link firms to transactions. As a result, evasion of taxes via fake input invoices and underreporting of sales became exceptionally difficult. The system was mandatory, and rollout was formally completed by the end of 2002. While the new technology unequivocally increased tax enforcement, the effect of increased enforcement on variables of interest is uncertain. For example, the ex-ante response of tax revenues is uncertain. On one hand, a decrease in evasion should increase tax revenues. But firms may also downsize, as better enforcement generates a higher effective tax rate, and firm downsizing will decrease the tax base and overall tax revenue. To estimate firm responses, we cannot simply compare the behaviour of firms before and after the policy. Many other changes may have happened concurrently, and any differences in firm behaviour could have been due to those changes rather than the Golden Tax Project. Instead, we observe that the intensity of the policy’s effect should vary systematically across sectors. By comparing firms that faced a more intense treatment to firms that received a less intense treatment, we can isolate a causal estimate of firm responses. Where does variation in treatment intensity arise? After computerisation, all firms in China faced a uniformly high level of enforcement. But before the policy, tax authorities focused their limited energy on a smaller subset of firms. For those firms facing high pre-period scrutiny, enforcement changed relatively little due to the reform. On the other hand, firms facing little to no pre-period scrutiny faced a massive change in enforcement due to the computerization. In practice, a strong determinant of pre-period scrutiny was sectoral structure. Auditors focused their attention on sectors with a low ratio of deductible inputs to sales, which we call the ‘VAT share’. Firms in these sectors could overreport inputs or underreport sales while generating relatively little distortion in their final VAT rate. These sectors’ structural advantage in evasion led tax officials to audit them more intensely. As a result, after the Golden Tax Project led to a uniformly high level of enforcement across all sectors, low VAT share sectors were treated the least, and high VAT share sectors were treated the most. 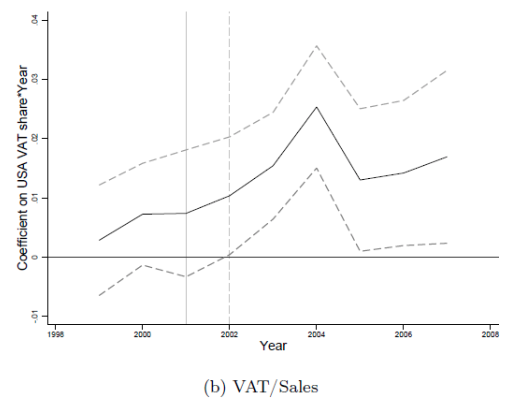 By comparing the behaviour of firms in high VAT share sectors to the behaviour of those in low VAT share sectors, we can isolate the effect of computerisation on firm behaviour. However, we face an empirical challenge in computing the VAT share. Chinese data prior to 2001 is distorted by evasion. On the other hand, Chinese data after 2001 include the consequences of the reform. Our solution is to construct a measure of the VAT share of each Chinese sector using data from US input-output tables. We use China’s deduction rules to compute the share of deductible inputs for each sector, and then match US sectors to Chinese sectors. We argue that the US data capture fundamental characteristics of each sector, absent context-specific evasion and treatment effects. With this measure of VAT share, we can begin to explore the policy’s consequences. 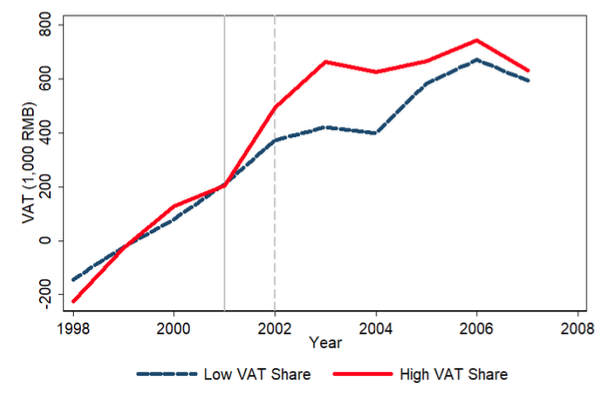 In Figure 1, we compare the average reported VAT for firms with above- and below-median VAT share over time. We observe very similar trends in these two groups prior to reform. Moreover, after the reform, we find that high VAT share firms paid differentially more VAT payments from 2002 to 2004, but the gap declined from 2004 to 2007. This evidence suggests that the short- and long-run effects of the reform on VAT payments were positive but declining over time. Notes: The data are normalised to be visually comparable. The pre-computerisation mean of each group is subtracted from the value of each year in the group. This general pattern remains when we control for more variables. In Figure 2, we present the estimated difference between high VAT share firms and low VAT share firms. By controlling for year fixed effects and firm fixed effects, we remove any variation that affected all firms equally in a given year, as well as any long-run differences between firms. We also control for initial size interacted with year fixed effects, which absorb any differences in firm behaviour by size within each year. 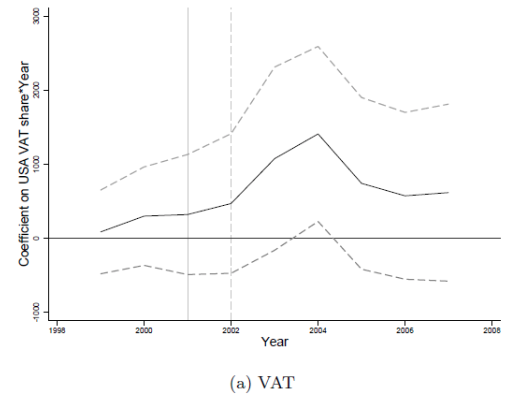 Just as in Figure 1, we observe that VAT payments increase differentially for high VAT share firms until 2004, at which point they begin to decline. Notes: These figures plot the interaction coefficients of VAT Share and year dummy variables (controlling for the interaction of pre-computerization average sales and year fixed effects, and year and firm fixed effects) and their 90% confidence intervals. The sample is a balanced panel of firms, 1998-2007. The reference year is 1998. We explain these results with a simple framework. Suppose that firms can respond to policy changes, but some of their inputs, like fixed capital, cannot be adjusted quickly. In such a scenario, an increase in tax enforcement will increase effective tax rates. Firms will wish to downsize in response to the increase in effective tax rates, but they cannot change all their inputs. In the short run, limited firm downsizing and the increase in tax rates will lead to an increase in overall tax revenues (if demand is not too elastic). However, in the long run, firms will be able to fully adjust in response to the new tax regime. They will choose fewer inputs and produce less output, and this effect will attenuate the increase in tax revenue. This explanation has implications for other firm observables as well; it suggests that over time, firm sales, inputs, and employment should decrease steadily. Moreover, productivity, which is conceptually similar to the ratio of output to total inputs, should increase steadily. When we examine these variables, we find that they behave consistently with our interpretation. The increase in VAT causes firms to contract in the medium run. An alternative interpretation for the short-run increase and the long-run attenuation in VAT payments is that firms learned to evade again over time. Anecdotal evidence suggests that evasion still exists – firms may purchase legitimate invoices from a black market. This explanation implies that the deductible inputs of firms, after a short-term decline, should rise again as firms learn how to falsify deductibles under the new system. However, when we examine deductible inputs, we find that they decline monotonically over time. Thus, there is little evidence that firms learn new ways of evasion. These patterns suggest that information technology can improve state capacity in a developing country context. This result relates to a literature exploring the role of technology in governance. For example, Duflo et al. (2012) provide experimental evidence that time-stamped photographs improve teacher attendance in India, and Muralidharan et al. (2016) show that biometric technology improves the delivery of state subsidies in rural India. We also enlarge the body of evidence on firm responses to tax enforcement (Kumler et al. 2013, Naritomi 2015, Pomeranz 2015, Carrillo et al. 2017). Our estimates provide novel empirical evidence that medium- or long-run effects are likely to differ from short-run effects. In particular, we argue that firms may downsize in response to an increase in tax enforcement, and that these real effects can decrease the gains in tax revenue due to better enforcement, especially in the long run. Carrillo, P, D Pomeranz, and M Singhal (2017), “Dodging the Taxman: Firm Misreporting and Limits to Tax Enforcement,” American Economic Journal: Applied Economics 9(2): 144–64. Duflo, E, R Hanna, and S P Ryan (2012), “Incentives Work: Getting Teachers to Come to School,” American Economic Review 102(4): 1241–1278. Gordon, R H and W Li (2009), “Tax Structures in Developing Countries: Many Puzzles and a Possible Explanation,” Journal of Public Economics 93(7-8): 855–866. Keen, M and B Lockwood (2010), “The Value-Added Tax: Its Causes and Consequences,” Journal of Development Economics 92(2): 138–151. Kleven, H J, M B Knudsen, C T Kreiner, S Pedersen, and E Saez (2011), “Unwilling or Unable to Cheat? Evidence From a Tax Audit Experiment in Denmark,” Econometrica 79(3): 651–692. Kumler, T, E Verhoogen, and J A Frias (2013), “Enlisting Employees in Improving Payroll-Tax Compliance: Evidence from Mexico,” NBER Working Paper 19385. Muralidharan, K, P Niehaus, and S Sukhtankar (2016), “Building State Capacity: Evidence from Biometric Smartcards in India,” American Economic Review 106(10): 2895–2929. Naritomi, J (2015), “Consumers as Tax Auditors,” Working paper, London School of Economics. Pomeranz, D (2015), “No taxation without information: Deterrence and self-enforcement in the value added tax,” American Economic Review 105(8): 2539– 2569.